The Epiphone Thunderbird Vintage PRO Bass Guitar in Tobacco Sunburst resurrects the classic style that was introduced back in '63, and has been used as the driving backbone for tracks by The Who, Lynyrd Skynyrd, and Cheap Trick. Boasting the same profile as the original factory models that were designed by Ray Dietrich back in the early '60s, this is a powerful bass that boasts an outstanding pedigree at an affordable price. The Thunderbird is composed of a heavyweight 7-ply mahogany and walnut neck, which is attached to mahogany body wings with a sublime neck-through joint. The design creates resounding resonance along an impressive 34-inch scale length, which gives the Thunderbird its enviable sustain. The weighty design adds to the substantial yet manageable playing feel. The combination of woods establishes a heavy mid-range to low-end tone, which retains a smooth warmth and luxuriously softened upper frequency range. Attached to the body is a 1960s TB-Bass Tune-o-matic adjustable bridge and Claw tailpiece, which anchors each string securely for a reassuringly steadfast hold. The connection between strings and body is delightfully flush, which optimises intonation and sustain to give your tone a rampant character. At the other end of the neck, the headstock is fitted with open-gear bass tuners with historic "Clover" buttons that boast a whopping 17:1 gear ratio. Working in partnership with the imitation bone nut, you can rest assured that string tension and tuning integrity are upheld dutifully throughout each and every performance, night after night. 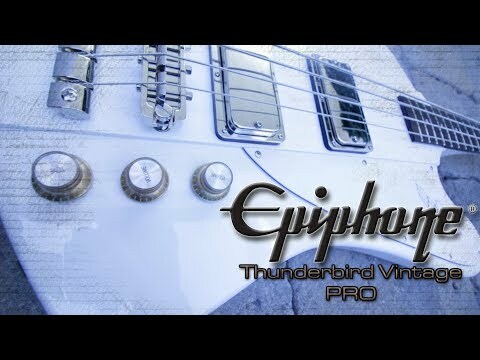 The Epiphone Thunderbird Vintage PRO Bass Guitar comes fitted with a pair of Epiphone's ProBucker Bass #760 humbuckers in the neck and bridge positions. The ProBuckers are made using sand-cast Alnico II magnets, with high quality 4 conductor lead wire, and are vacuum wax potted to eliminate microphonics for the smoothest tone. Whatever style of music that you play, these beauties are exceptionally versatile. Gold "Top Hat" control knobs with metal inserts allow you to attenuate volume for neck and bridge pickups, with a master tone control to adjust both. The Epiphone Thunderbird Vintage PRO Bass Guitar is supplied in a Tobacco Sunburst finish with nickel hardware. The cool nickel hardware complements the finish perfectly, with vintage features such as the gold silkscreened Epiphone log on the truss rod cover. Let us not overlook the iconic Thunderbird logo on the white pickguard - the true mark of power.